Due to security breaches in OS-level OpenSSL library distributions (e.g. the Debian OpenSSL "fix") and the general problem of old OpenSSL libraries on systems, we have chosen to integrate the most current versions of the OpenSSL libraries directly with the package - on Windows and all supported Unix platforms as well as Mac OS X. 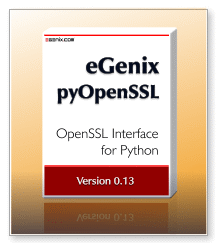 The current version of OpenSSL shipped with the eGenix.com pyOpenSSL Distribution can always be determined by looking at the second part of the distribution file version number, e.g. 0.13.1.1.0.1.5 means that we have taken pyOpenSSL 0.13, added OpenSSL 1.0.1e (the letter is converted into a number a=1, b=2, etc.). Since we've added a new module to pyOpenSSL, we've bumped the version number to 0.13.1, instead of using 0.13.0. In some cases, we have to release distribution updates, which we then signal by attaching an additional version integer to the end of the version string, e.g. 0.13.1.1.0.1.5.1. Starting with version 0.13.1.1.0.1.5, we always include the most recent certificate authority (CA) certificate bundles derived from the from Mozilla Firefox browser code base as CRT file with the distribution and also include a helper module OpenSSL.ca_bundle to easily access these embedded CA certificate lists for verification purposes. The CA bundles are updated with each new release of the eGenix pyOpenSSL distribution, but we also make them available as separate download.